What is Radian C Serum? Radian C Serum is an anti-aging product that the manufacturer claims will reduce the wrinkles and fine lines on your face, remove discoloration spots on the skin, hydrate your skin and brighten up your complexion if you use it regularly. It contains ingredients such as vitamin C and hyaluronic acid. The vitamin C goes into the deepest layers of your skin, making your complexion glow. There is both high and low molecular weight hyaluronic acid for hydrating both the surface of your skin and deep into your skin’s layers. This product is meant to be used on a daily basis, and it is made for every skin type. Who is the Manufacturer of Radian C Serum? 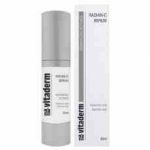 Radian C Serum is manufactured by Vitaderm, an organization based in Bellville, South Africa that produces skin care products. The company specializes in anti-aging products specifically. The products are sold both online and in 450 spas and skincare clinics. Vitaderm doesn’t test any of their products on animals. They have also launched a program to recycle the paper and plastic used in the packaging of the product. How Does Radian C Serum Work? There isn’t a full ingredient list on the Vitaderm website, so it’s not possible to give a complete account of how this serum works. The company does disclose that there is Hyaluronic acid in the product, which is a substance in the skin that draws water to it and thus moisturizes the skin. They also mention ascorbic acid (vitamin c) as an ingredient. Vitamin C can help synthesize collagen, which is a protein that can reverse the effects of aging on the skin. Radian C Serum Ingredients – Are they Safe & Effective? The full product ingredient list is not provided on the Vitaderm website. They do mention the following two ingredients, but that’s not enough to do a full evaluation of what this product really is and how it functions. Hyaluronic Acid: This substance already exists in the body. As a humectant, it absorbs water and so it keeps the skin hydrated and looking very moisturized. Eliminates dry skin quickly. Ascorbic Acid: Nutrient that makes up a portion of Vitamin C, and which has properties that make it good for the skin. It has antioxidant properties and it participates in synthesizing collagen. Collagen is the protein responsible for the skin’s elasticity and is known to reverse some of the effects of aging on the skin. What are the Advantages of Radian C Serum? What are the Disadvantages of Radian C Serum? Radian C Serum has almost no smell. How Should You Take Radian C Serum? Twice a day, in the morning and in the evening, wash your face with your regular cleansing soap. Then take 3-5 pumps of the Radian C Serum applicator into your hand and spread it all over your face and neck. Let it dry and then apply your moisturizer and sunscreen as usual. How Much Does Radian C Serum Cost? There are no prices visible anywhere on the Vitaderm website. There is not even a visible Terms and Conditions section. Although products with a similar name can be found for sale online, this one does not exist anywhere else. In order to get a price list you likely have to contact the phone number or email listed at the top right-hand corner of the website. What is Radian C Serum’s Return Policy? There’s no evidence of any return policy anywhere on the Vitaderm website, and no Terms and Conditions sections visible. Again, to get this information you would likely have to contact the customer service numbers provided. Does Vita Radian C Serum Offer a Free Trial? There’s no mention of a free trial anywhere on the Vitaderm website, nor any mention of free samples of products being provided to customers. It would certainly be to their benefit to offer samples to customers so that they could test out the product. This is an wrinkle serum produced by a South African skin care company called Vitaderm. The manufacturer claims that it moisturizes the skin, erases the signs of aging on the face and gives skin a rosy, healthy glow. There are not very many customer reviews online for this product, although the ones that do exist are positive. Customers report that the product makes them look younger and gives their face a healthy shine. One big downfall is the lack of information about the product or the company’s policies on the Vitaderm website. They don’t provide a full ingredient list, which is problematic, particularly for people who are sensitive to different substances. There are no prices listed for their products on the website, and no return policy or customer service policy visible anywhere. Before you decide to purchase this product, make sure you research related products to compare prices and effectiveness and ingredients. It’s important to be as well-informed as possible before starting to use a new product on your skin.